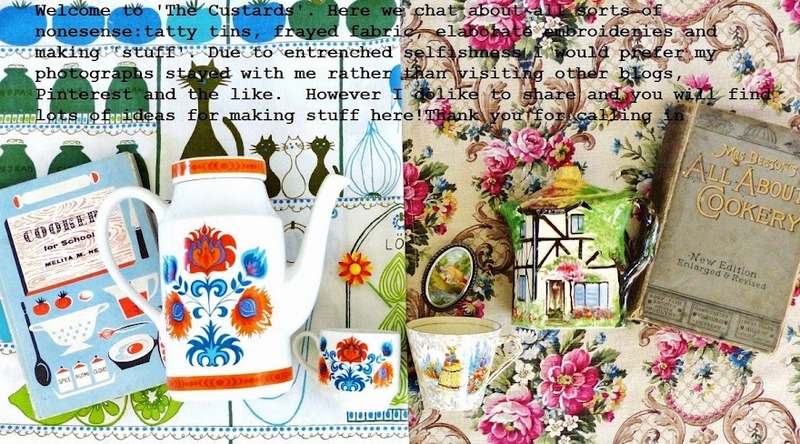 I am sure that you too are fond of items that have a souvenir theme - you may be a little surprised to learn that I have one or two such things (cough, cough) and a few souvenir tablecloths (oh dear this wretched cough when will I be rid of it!). 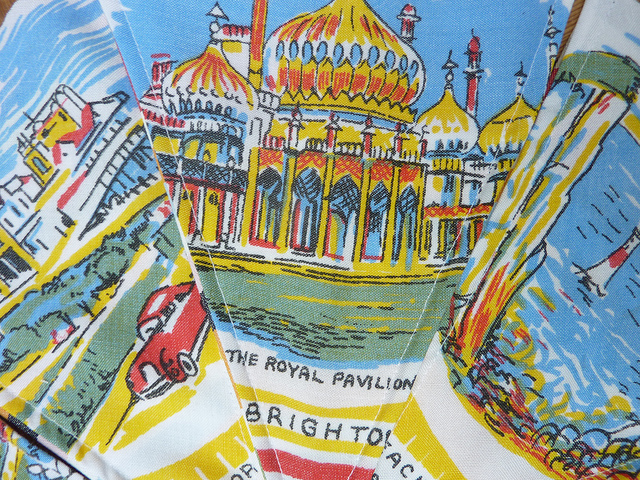 I now try and hang (cling desperately) on to only souvenir items that are local/local'ish to ourselves....fortunately/unfortunately that means quite a bit then..
Old seaside bunting from a while ago....this time Brighton is stain free - hurrah! This is a jolly tea towel - I use my tea towels until they are threadbare and then I use them for cleaning purposes (oh but not my really, really nice London ones - they are in frames!). My dear friend Bryony lives in Cuckfield (see below). All of these have been bought in local shops and I like them all and the different styles. 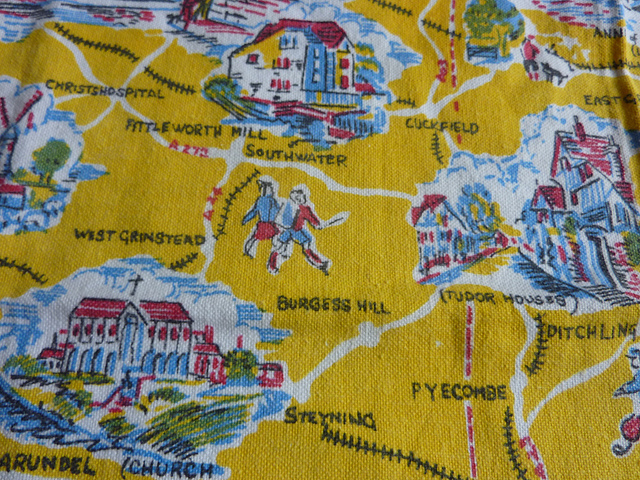 I cannot quite remember now but I turned an old tea towel into a series of purses and I think that this is somewhere in the East of England (perhaps someone can let me know please). This tea towel of Cornwall I bought years ago and was going to sell it when I saw that Cath Kidston had the same one being sold for £29! Yikes - I have saved it for my retirement plan (let's face it I think that tea towels are probably a safer investment than stocks and shares!). 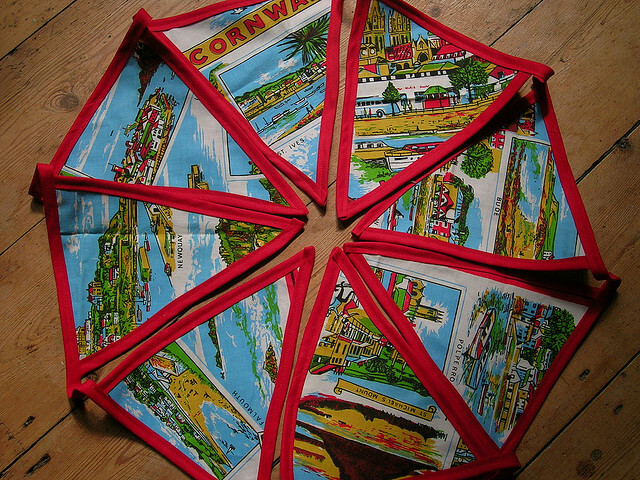 I will finish with an old Cornish tea towel - falling apart but nice images. Just realised that I have forgotten the tablecloths that are local to where we live - I will save those for another day! PS: Fully realise the folly of my ways and of course everything is up for grabs on the internet - it is no different to thinking that if you cross the road you should expect to be knocked down, that if you walk round at night you should expect to get mugged, that...... Silly of me not to realise this sooner - do apologise. I am joining the 'grab it while I can - what's yours is mine' world.....A final hurrah is that I notice Pinsect have done something strange to my account (only to request that my photographs are not used by the way!). What a charming and delightful company they are. Aww - thank you kindly. 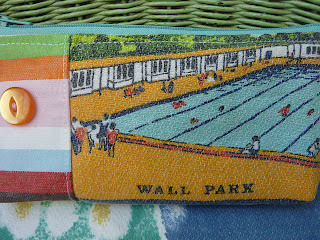 Love your old seaside bunting...really cracking. Regarding Pint-a-poo.....It puzzles me that people have become so addicted to it and refuse to see how invasive and destructive it can be - in so many ways. There's a real 'sheep mentality to it all as well. I totally understand your issue with it. Thank you Wendz - anything with nice colours and good graphics will suffice don't you think. That makes tea towels a pretty good bet. 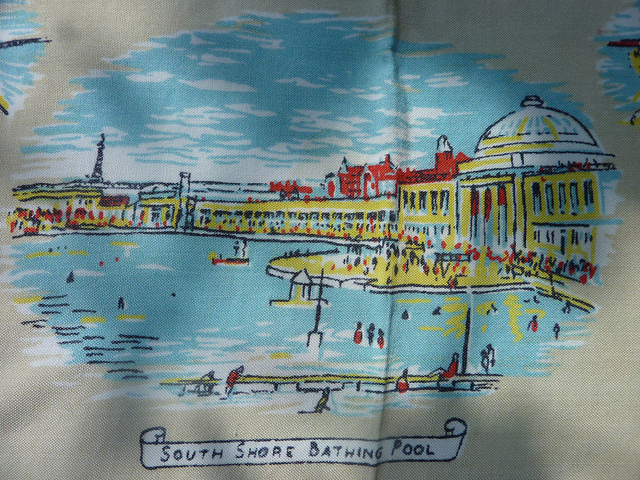 As I have closed Flickr I will assemble some of my tea towels here I think one day. Thank you about seaside bunting - that gets hung outside our front door every summer (seasonal change of bunting!). 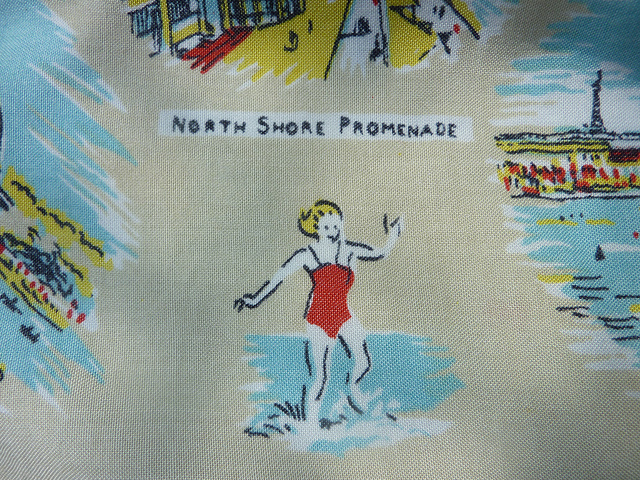 Fab cloths... especially love the cornwall one as you say the graphics are really great!! I understand your sheet addiction Ada - we use them until threadbare in the middle (haven't quite done the old trick of sewing outer edge into the middle....yet! Welcome aboard lemonade kitty and thank you indeedee for your kind words. One tea towel is enough for one 'set' of bunting - you have to be careful with how it is cut out so as not to 'spoil' the good pictures! Do post a picture if possible. 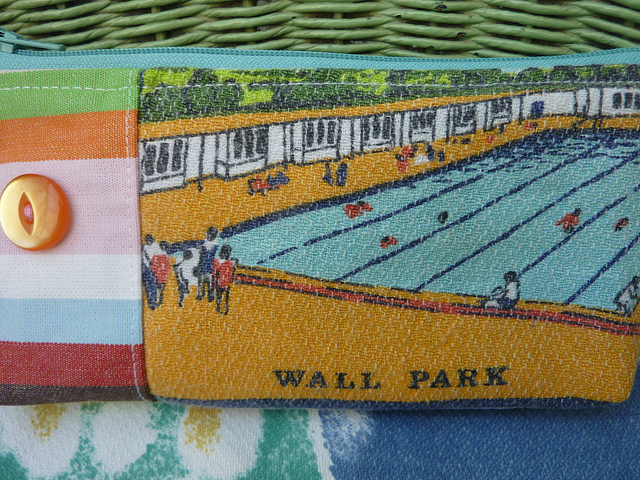 What lovely, cheery cloths, and great bunting from them, too... I picked up two scarves with similar maps (Australia and Tenerife) from a Vide Grenier a few weeks ago - I should really take some photos! Can't wait to see more tablecloths through the ages too... And stick to your high (old fashioned?) morals - never mind how others have been behaving! Ah now you're talking Floss - I do like a nice scarf. I have used old silk ones to make purses in the past, I will try and dig out a photo. Old fashioned and proud I am! Hurrah! Tea towels rule! Oh dear - getting out of hand now! Lovely! The Kent and Sussex one has some of my favourite places on it, well I would imagine they are on the bit on the edge just out of the photo. I wish you had a Southend on Sea one! You may well have, I am going to start the hunt for one! Oh I am so envious of your tea towel collection. I used to have a collection but them I met my husband who does not have a collection bone in his body so the tea towels went (all apart from a few choice ones). We always used to buy my Nanny a tea towel when we went away on holiday. We found them all, unused, in the bottom drawer of her chest of drawers when she passed away. I don't know what happened to them then. They may well now be in your collection! Oh - that is the saddest thing. Tea towels were/are so often stored away that is why I like to use them....a bit like tablecloths.....If I have them I will send them back! 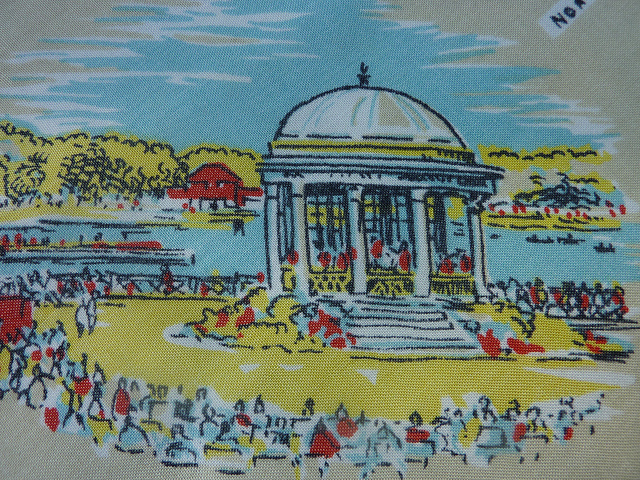 I'm on the lookout for an old Norfolk tea towel. Maybe when I am there on holiday in August I'll find one in a charity shop. Like Philippa we always brought home a teatowel when we went away on holiday as children but they all got used drying dishes! 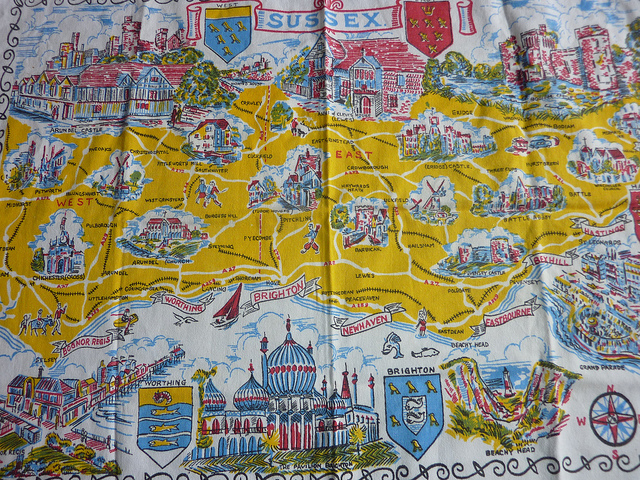 Oh I love these type of tablecloths and tea-towels Jenny, I have a few and like you, will now only buy ones that are relevant to places I've been. Being in landlocked Worcestershire, they are almost impossible to find here though. Thank you Sairer - I did reply all that time ago - lost in the ether prehaps. I have sent you a message. Lovely, lovely collection. I really like the artist that designs the cornwall one, I have some others that look similar from other locations. Would love to know who designed these. Many thanks - yes indeed, these designers are the unsung heroes/heroines of teh designer world yet they must have been sold in their thousands!